Inspired by Jamie Oliver and Amanda Soule, with the last tomatoes I’ll find at the local market, what a better way to use them if not simply roasted in the oven? You can have them as a side dish, or blend them and use it as a sauce or for the pizza. 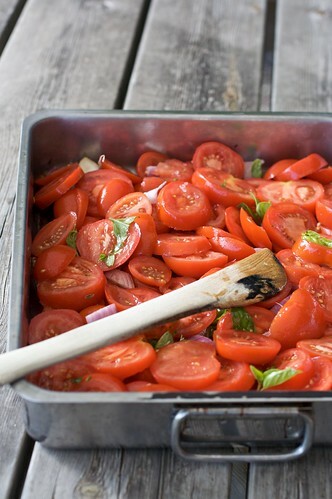 Pre heat the oven at 210° C.
Slice the tomatoes: not too thin, not too thick, let’s say 1 centimeter wide. Pell and halve shallots. Leave the garlic cloves with their skin on. In a big roasting pan, pour 2 table spoons of olive oil. Add tomatoes (and all the juices came out from cutting), shallots, garlic, basil and thyme and sprinkle with salt. Roast in the hot oven for 30 minutes or until well roasted.